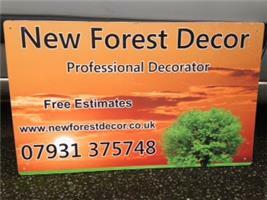 New Forest Decor - Painter/Decorator, Plasterer based in Hordle, Hampshire. I have been established for many years in the Lymington and New Forest area. My expertise and experience since 1988 has ensured that I have become a trusted, established company with a reputation for reliability and quality. All my work is to a high professional standard and I believe that preparation is the key to a successful long lasting job using top quality materials. Covering the Lymington and New Forest area and catering for all your Domestic, Commercial and Insurance requirements. If you need the services of a painter & decorator in the Lymington and New Forest area, I will be happy to talk about your requirements and help you in any way I can.